Black and white negative of women getting ready for a game at the Whitby United Church Sunday school picnic in June of 1939. The women have their shoes in their hands. Spectators are visible in the background. 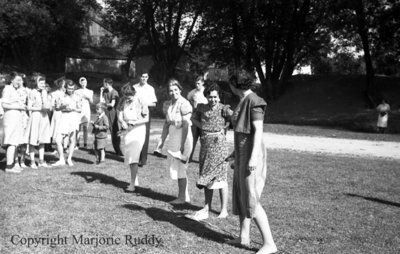 Sunday School Picnic Whitby United Church, June 1939, Marjorie Ruddy. Whitby Archives A2013_040_931A.